The Associated Press has removed an image of Andres Serrano’s 1987 photograph “Piss Christ” from its image library following Wednesday’s attack against the French satirical magazine Charlie Hebdo. “It’s been our policy for years that we refrain from moving deliberately provocative images. It is fair to say we have revised and reviewed our policies since 1989,” AP spokesperson Erin Madigan told POLITICO, referring to the year the AP first posted the photograph. Until today, the AP’s policy allowed for Serrano’s photograph, which depicts a statue of Christ submerged in urine and has repeatedly caused controversy when exhibited. “Piss Christ” was once vandalized, and both Serrano and gallery owners have received death threats over the years. Both the cropping of the Hebdo cartoons and the decision to remove Serrano’s photo have been interpreted by many as a capitulation to the attackers’ efforts to limit the freedom of expression. Though there identity is as yet unknown, the masked gunmen are believed to be Islamic terrorists. 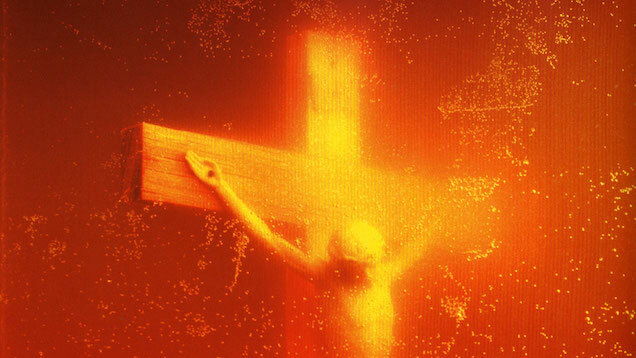 via AP pulls ‘Piss Christ’ after Paris attack.